The Acoustic Research 2x and 2ax (AR-2x / AR-2ax) are based on the design of the AR-3a, but were marketed as a value product, which means price played a crucial role. Therefore it contains most of the typical elements and ingredients as the high-priced Acoustic Research speakers, but has a slightly lower performance. The AR-2ax is a 3-way acoustic suspension speaker, meaning that its cabinets are completely sealed. The AR-2x is a 2-way acoustic suspension speaker which does not have the 1 3/8 in dome-type super-tweeter of the AR-2ax. 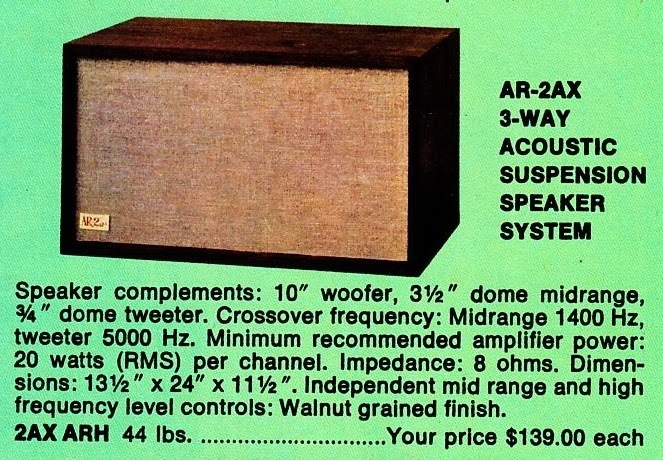 According to a press comment, prices in 1971 for these speakers were similar, with the AR-2x being sold for $102 (in walnut) and the AR-2ax being sold at a slightly higher price for $128 (in walnut). The speakers were also available in different cabinets, priced at $89 / $109 for unfinished pine cabinets or $96 / $122 for mahogany/ birch cabinets. However, it seems that different sources have very different prices, not at last because the speakers have been sold for many years and prices decreased over time. As you can see at the Acoustic Research ad above, the AR 2Aax has also been sold for $139. I own 3 pairs of the 2AX, all bought at yard sales in southern Maine where my wife and I have a summer home. I paid very little for each pair- usually they were being sold by adult children of the original (male) owner. First the bad news: They usually require new surrounds- the originals dry and deteriorate from UV damage over time. Additionally, the trim pots (the little tone controls on the rear) need to be sprayed with tuner cleaner or "Detoxit" . These controls usually have poor internal contacts due to age- this causes tweeter or midrange drop outs. Once you address these issues, you have a well made (VERY well made,actually) solid (Very solid) speaker that sounds very respectable. Personally, I think the 2AX can be compared to (and exceed) many current loudspeaker systems in the $400 to $600 a pair range. Place them on 1 foot high stands, 7 or 8 feet apart, at least 2 feet away from back and side walls toe them in a bit and you'll be pleasantly surprised at their performance. I have run them with 15 watt tube amplifiers (Pilot 232) and 200WPC solid state units and found them to be listenable long term, with good fidelity and few flaws. Are they competitive with current speakers costing $400 to $700? Sort of: current speakers present greater speed and detail, but often unless they are used with the right cable/interconnect/amp they can sound too detailed. Real music played live doesn't sound shrill or peaked. So, if you come across some yard sale AR2AX's at cheap cost, give them a try. You may be very surprised! Thanks for your great input! Unfortunately it is becoming rare to find one of these on a yard sale for a very low price. I picked up a pair of these at Goodwill five or six years ago for $19. The foam was rotted and I suspected the caps were shot, so I did a complete restore. Mind you this was my first attempt at refoaming any speakers. I had re-capped speakers before with mixed results. I have to say if you take your time and follow the directions, refoaming is a fun and rewarding exercise. Now I have been enjoying these speakers for several years and I have thought to myself I may never give these up. They sound that good! I later went on to restore several other speakers (Wharfedale, Large Advents) but I keep coming back to these. The sound is buttery smooth and not fatiguing at all. They don't sound "analytical" or "grainy." Every time I listen to them I have to remind myself that they were made in 1970, because they handle all kinds of music with aplomb, from jazz and acoustic to modern electronics-laden rock and metal. Great speakers! How did you get the front off without tearing or breaking the board underneath it. Mine is in so tight very difficult to loosen and lift out the covering to get to the loudspeakers. I wrote an extensive description of what I did to get the front off. But when I clicked preview, the whole thing disappeared. I assume when one clicks preview, a screen of the post comes up for review and correction/additions,etc. and not disappear. I think changing this would be an improvement. Whether I will rewrite my experience and post it is problematic. Hello and thanks for taking the time and sharing your problem with the preview function. Unfortunately, I cannot remove the preview function (or change it), as it is part of blogspots service. I found your review to be most interesting. I acquired my two AR-2axs in the USAF BX in Kunsan, Korea in 1975. I replaced the caps and the pots were in excellent condition. I retained all the fibre glass. I also had to replace the foam surrounds on the woofers. In my case the grill covers were held in place by Velcro, so no problem there. They are in use today in my living room. I just found a pair of these Acoustic Research AR-2ax speakers at a yard sale today (5/8/14)here in Southern California for $20.The guy wanted $40 and I offered him $20 without testing them and he took it.I tested them out later that day and they both work.The walnut cabinets are in pretty good condition too and they both have the original paperwork on the back of them. Great to read your review. I bought a pair of AR-2ax speakers back in 1974 as a student in Edinburgh. They've been with us ever since, take pride of place in the living room and are in regular use. I had to have the woofers re-foamed in 1997 while out in Australia and I ended up by-passing the pots. I keep meaning to replace the caps... I must be due an upgrade by now ;) but they still sound great and I now can't bear to replace them. The grills on mine were also stapled. I took a fine narrow flat nosed screwdriver to pry the staples off. Then, I carefully used the same screwdriver to separate the grill from the cabinet face. It can be done but unfortunately, in my case, there was slight damage to the cloth but still useable. I have a pair of 2AXs since the late 60s. Changed the potentiometers to high quality rheostats and also the capacitors with high quality ones. I am not an audiophile but I do like the sound but I do notice when a lot of horns, string, etc are together the sound does sound harsh and the instruments are not discernible. Is it my hearing or the system? I'm using the same speakers, over about 45 years old and I wonder if the cone of the woofer has aged out of usefulness and the same with the mid and tweeter. Other then the problem with the mixed horns etc., I like it with everything the way it has been from the beginning. God help me I bought another pair of these today for $70 but the woofers are rotted and mismatched. So I have stacked advents, klh Sixes and 2 pairs of these. Who can tell me what color the 1 3/8 tweeters are? Are they the ..best.. tweets the 2axs ever came with? I recommend using an audiokarma.org forum to get reliable answers for your questions. The founder is an engineer who used to design speakers. I guarantee that someone in the speaker forum would help you. You can access most of the site for free but some forums require a nominal membership fee. I got a paint can opener that has a bottle opener at one end and a hooked end on the other, pry tool to lift the lid. This works great to pull the stapled covers off speakers. The scraper end works really well with the opener laid flat, and then with the hooked end in the edge gap, rotate the opener upright with the hooked end now underneath the edge near the corner. Slide it to the staple and lift straight up. With this corner lifted, keep sliding the opener around the perimeter and then after the cover is all lifted up use a small blade screwdriver or a narrow paint scraper to remove the staples. I picked up a pair of AR-2ax speakers a few months ago. These are the earlier model with cloth surrounds so no problem with rotting foam surrounds. They have the 1 3/8ths inch red hard dome tweeter with what appears to be very fragile wiring to the tweeter. Woofer is 10" and the mid is a 3.5" paper cone with a mat of what looks like fiberglass. Not sure what it is since I didn't take them out or inspect them - they work fine. Grills were hot glued on. To remove the grills I took a couple of sheet rock screws and drove them in to the Masonite far enough to get a good bite on the grill frames and slowly pulled up on each screw at the same time. The hot glue (six places) popped off easily enough and zero damage to the very nice original grill cloth. The fiberglass fill was more like dust. It all got tossed and replaced with 30 ounces of new fiberglass in each speaker. Whatever you do either put the old fiberglass back or get new to replace it. The bass is terrible without the fiberglass fill. I reconditioned the rheostats by soaking them in vinegar and salt solution - then polished the contact surfaces with 320 grit emery cloth. They shined up real nice. I replaced the old worn out caps with new metalized poly caps from Parts Express - one 4mfd and one 6.2mfd cap in each. The old caps were removed and tossed. I reused the old sealer by rolling it out on a flat surface until it was long enough to go around the entire woofer sealing surface - then flattened it and laid in out on the speaker flange. After you 'think' your done check for air leaks around the woofers. Use a 2-3' length of old garden hose and slowly push in the woofer cone while listening for leaks. If there is one you'll hear it. I had zero leaks. I have one rheostat on the tweeter side with a dead spot way down on the low side. I was kind of surprised that these are a bit on the shrill side when I first fired them up - driving them with a Sansui 500a tube receiver with 20wpc. After playing around with both pots I find that the shrill is best dialed out by using the mid driver. Turning the pot down by about half tamed that pretty good. Bass response is wonderful and the mids and highs are better than I expected. I owned a pair of AR-2 speakers back in the late 60s early 70s with a Sansui 500a - which is why I have this setup now. I'm reliving some of my youth! The AR-2ax is a great sounding speaker considering how old they are. Speaker tech hasn't really changed much in 50 years. I have better speakers in my living room but they cost considerably more than these. I've got about $140 into them with the new fill and new capacitors. I'll do it again if I find more of these. The walnut cabinets aren't perfect but like a car with a 10' paint job they look great from 10'! I love them and I play mostly vinyl. Has anyone heard of the AR-2xa? That's what mine says on the back paper where the serial number is. Also, the cabinet has another piece of wood around the front of the cabinet, not a flush wood cabinet at the front edge. I just picked up a matched pair of early AR-2ax this past weekend with sequential, low serial numbers - 01078 and 01079. Both the model and warranty tags are fully intact, including the tear-off portion of the warranty card, still fully blank. Wow can you say how much they cost?